Lagar da Xestosa is a joint venture between Adegas Pazo das Tapias (the winery) and “The Wine Searchers”, Ramon Romero & Eric Miller, two wine aficionados, passionate about Spanish wines, who recently decided to put together an importing/distributing company in Maryland, in order to share their passion and their finds. Their office in Spain is registered at Puente La Reina, a commune of the Navarra region, south of San Sebastian. Lagar da Xestosa, which comes in both red made from Mencia and white from Godello grapes, the two classical Galician grapes, is produced and bottled by Adegas Pazo das Tapias, a winery located close to the northern boundary of Portugal, in Pazos, a village on the west outskirt of Verin, Galicia. Located in the northwestern corner of Spain, above Portugal, Galicia produces some of the driest and most exquisite white wines in Spain, as well as some great, very enjoyable reds resembling in structure and texture to some of the Cabernet Franc based reds from the Loire Valley in France; yet with a bit more fruit and softer, better integrated tannins. Galicia benefits of an oceanic climate, which is ideal for the production of whites, more especially when it comes to the 2 most famous and established Galician grapes: Albariño and Godello. Galicia is composed of relatively low mountains and rolling hills without sharp peaks, where many rivers run down relatively gentle slopes in narrow river valleys, though at times their courses become far more rugged as in the canyons of the Sil River, Galicia's second most important river after the Miño. Topographically, a remarkable feature of Galicia is the presence of many firth-like inlets along the coast, estuaries that were drowned with rising sea levels after the ice age. These are called Rías and are divided into the smaller Rías Altas ("High Rías"), and the larger Rías Baixas ("Low Rías"); the region responsible for the success of the Albariño grape variety. Outside of Rías Baixas along the west coast, Galicia also encompasses other wine regions all along the way toward the neighboring ancient kingdom of Castilla y León, respectively from west to east (and south to north): Ribeiro, Monterrei, Ribeira Sacra, Valdeorras and Bierzo. 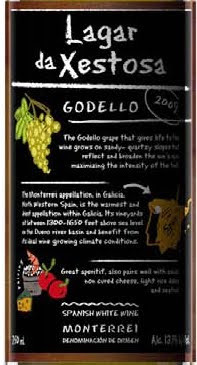 In these DO(s), Godello is preferred to Albariño, because it is more adapted to the type of soil and climate inland to produce white of very good quality. Adegas Pazo das Tapias is located in Pazo, a village on the outskirt of Verin, in the Monterrei D.O. (Denominación de Origen). Monterrei is a Spanish DO (Denominación de Orixe in Galician) for wines located in the southeast corner of the Ourense province in (Galicia, Spain). Monterrei DO covers the municipalities of Verín, Monterrei, Oimbra and Castrelo do Val. 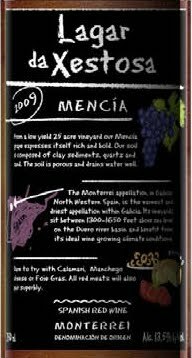 Long a neglected DO, Monterrei experienced a renaissance in the mid-2000s, which revived the appellation and triggered the curiosity of critics and amateurs from all around the world. In 2006, the Mendez family, strong of 40 years of world class winemaking experience, bought the winery, Adegas Pazo das Tapias, and its vineyards. Pazo dasTapias is nestled in the middle of its own vineyard, and encompasses probably some of the best vineyards of the appellation due to the age and healthiness of the vines. The vineyard was planted in the early80's with innovative techniques and only two indigenous grape varieties: Godello and Mencia. The vineyard shows clearly two different types of soil, sandy slope planted with Godello, where the bright soil and reflections from the quartz maximize the concentration of the Godello; and areas planted with Mencia reaching perfect phenolic ripeness indicate the great potential to develop breeds and stocks with these grapes. Combined with hard and rigorous work in the vineyard and taking in consideration the excellent location of the vineyard, the winery can only provide excellent quality grapes. The Bodega’s current capacity of production is 350,000liters, which receive adequate treatment with state-of-the-art technology, including: modern pneumatic presses, fermentation in stainless steel tanks, and a range of French oak barrels from the forest of Allier, into which the Bodega experiences different ageing processes for the Mencia reds. The climate of the D.O. Monterrei can be summarized as a mixture of continental and Atlantic climate, with generous rain fall throughout the year, very hot days in summer and very cold days in winter. Monterrei is the warmest and driest appellation within Galicia. Its vineyards sit between 396-500 meters (1300-1650 feet) above sea level on the Duero river basin and benefit from its ideal wine growing climate conditions. The Bodega’s vineyard area totalizes more than10 hectares of vines, planted at an altitude of 450 meters above sea level. The average climate temperature during the year is about 12.60 degrees Celsius, which is quite ideal and consistent. And the average number of hours of sunshine per year is about 2700 hours, which is perfect to reach appropriate ripeness. Made with 100% Godello vinified in stainless steel tanks, grown on sandy-quartz filled slopes that reflect and broaden the sun's rays, maximizing the intensity of the fruit. Behind its pale yellow-greenish color, the nose is clean and fresh, with zesty aromas of white fruit, tropical fruit, lime and lemon with floral and mineral notes. The palate is super crisp, light, bright yet fairly silky with excellent structure, harmony and enhancing acidity, nicely carrying the fruit toward the lingering finish. Great aperitif, also pairs well with salads, cheese, light rice dishes and seafood. Made from 100% Mencia grapes vinified in stainless steel tanks, grown on sandy-quartz filled slopes that are composed of clay sediments, quartz and sand. The soil is porous and drains water well. 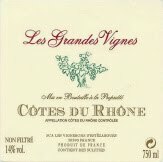 It reflects and broadens the sun's rays, maximizing the intensity of the fruit. It presents a dark ruby color. The nose is beautiful, elegant and expressive, developing aromas of ripe blueberry and blackberry with earthy, floral, purple flowers notes. The palate is extremely juicy, clean, soft and integrated, really well crafted, long and elegantly fruit forward, with earthy, lightly green hints. A crowd pleaser like the white, it will certainly satisfy Cabernet Franc drinkers and agreeably surprise others. Versatile and neither too light or to heavy, it is a good go to food friendly red wine for any occasion. 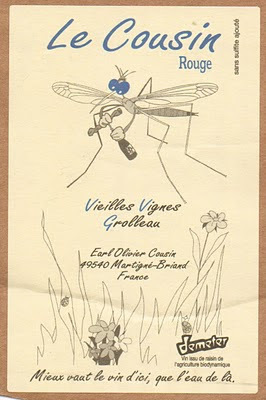 Lately, I wrote about a few wines from Jenny & François, which I tasted over the last few weeks, but I just realized that I forgot a very important one in term of Natural wine: "Le Cousin Rouge" Grolleau Vieilles Vignes. Olivier Cousin, owner of Domaine Cousin-Leduc, cultivates about 12 hectares of vines in and around Martigné Briand, a little village nestled in the fertile Anjou region, about 30 kilometers east of Saumur and about 33 kilometers south of Angers. 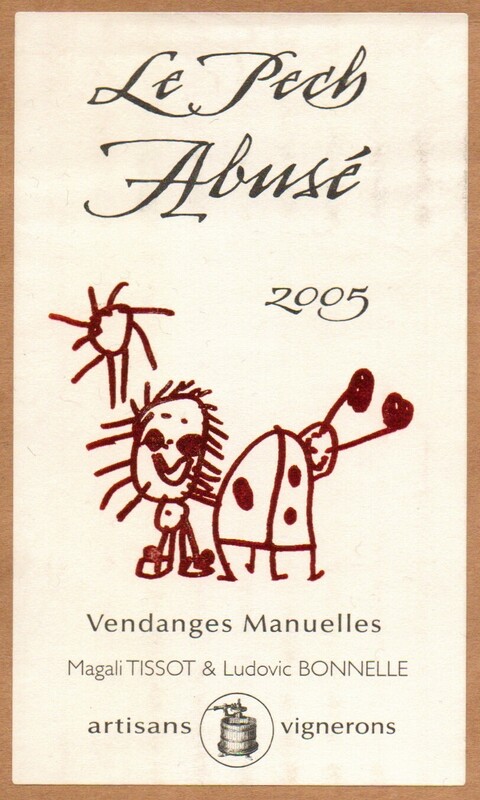 His vineyards are planted with Gamay, Chardonnay, Cabernet Franc, Grolleau and Chenin Blanc. 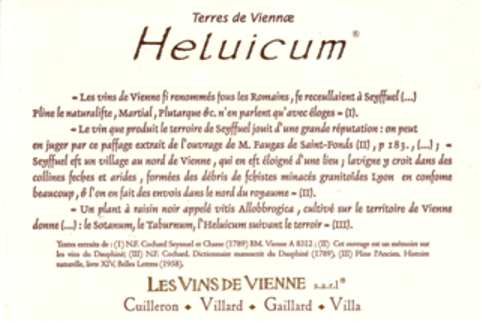 All of the wines Cousin crafts are certified biodynamic. 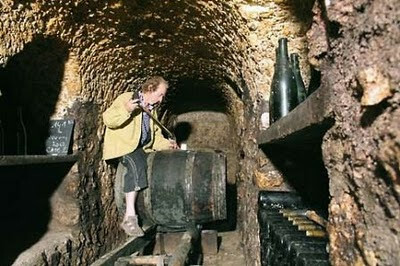 He plows his vineyards with his horse Joker, uses only indigenous yeasts and shuns enzymes, sugar and sulfites. Oliver Cousin is constantly experimenting to improve the quality of his wines, which often undergo an extended maceration, resulting in greater character to the final wines. He crafts wines that celebrate the harmony that exists between man and nature. His hard work and understanding of the vines in his small Loire Valley vineyard represent some of the finest natural wines that are currently available in the United States. The Domaine is entirely “Biodynamic Demeter” certified. 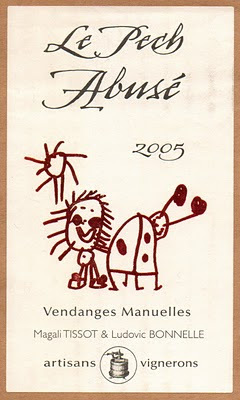 In the series of funny and cartoony labels, “Le Cousin” is a great example. 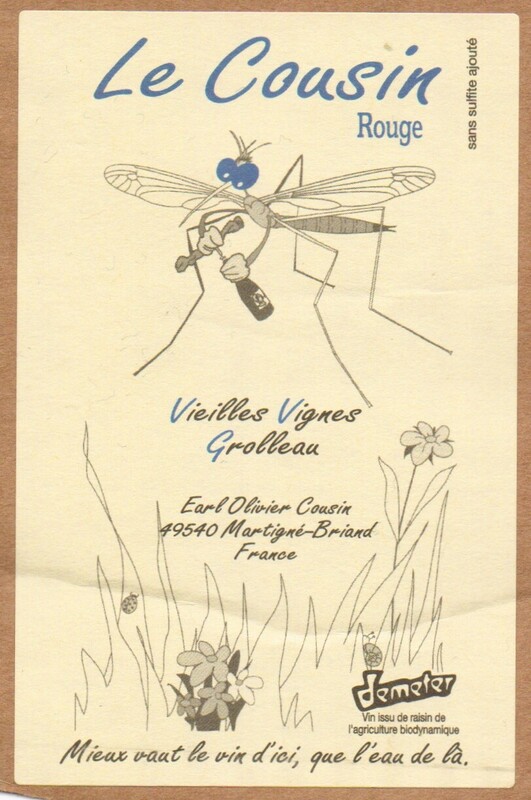 It is a play of words, between the name of the owner Olivier “Cousin” and the fact that a “Cousin” is also the name of a particular type of mosquito in France. Hence, the “Cousin” or mosquito opening a bottle of wine! Nicely done, Olivier! “Le Cousin” is crafted with 100% Grolleau (an ancient red grape variety indigenous to the Loire that Olivier Cousin, amongst few other winemakers, has brought back from the brink of extinction. ), from vines under Guyot and Gobelet pruning method. 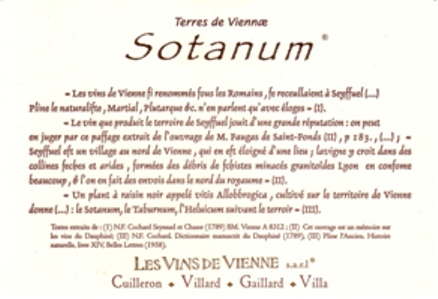 Averaging about 30 years old, the vines are planted on black loam infused with deep beds of limestone. The grapes are hand-harvested, brought to the winery by a horse, then destemmed and gently pressed. Only natural yeasts are used and the juice undergoes an extended maceration to maximize the extraction and add depth and complexity. 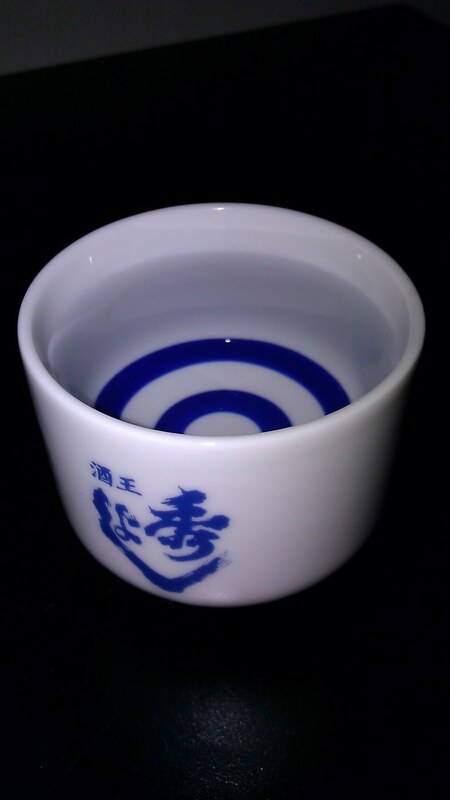 It shows deep, dark purple color. On the nose, very expressive, inciting aromas of freshly crushed wild berries and grapes, mingled with funky, earthy, barnyard and mineral notes, immediately emanate from the glass. The palate is rich, complex yet soft and gentle with even stronger flavors of freshly crushed wild berries and dark grapes than the nose. 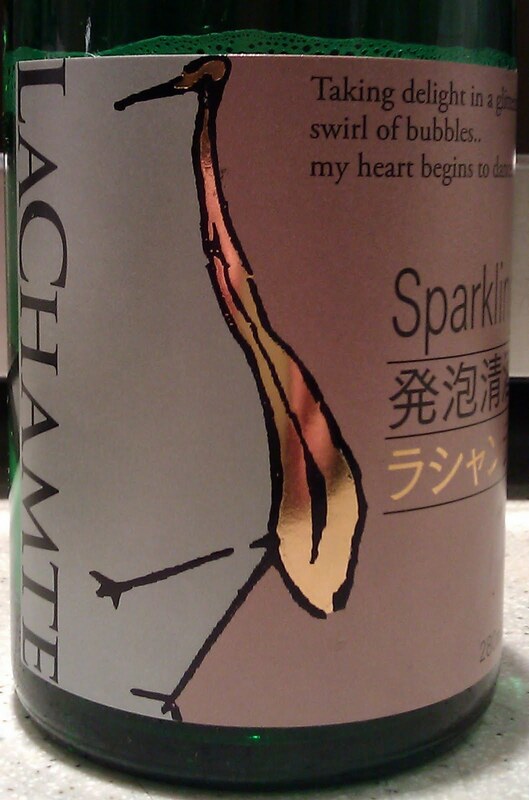 It also offers a focus, earthy profile enhanced by great minerality and reviving acidity. This is a buoyantly fruity and dynamic medium-bodied red that expresses the soil and Terroir it comes from. Definitely funky and unusual, ultra natural and really enjoyable, surely not your everyday wine, yet after you tasted it it could become your everyday wine! Good on its own, it will pair pretty well with rabbit stew, veal chops, braised pork loin, paté, herb encrusted roast chicken or simply by itself. 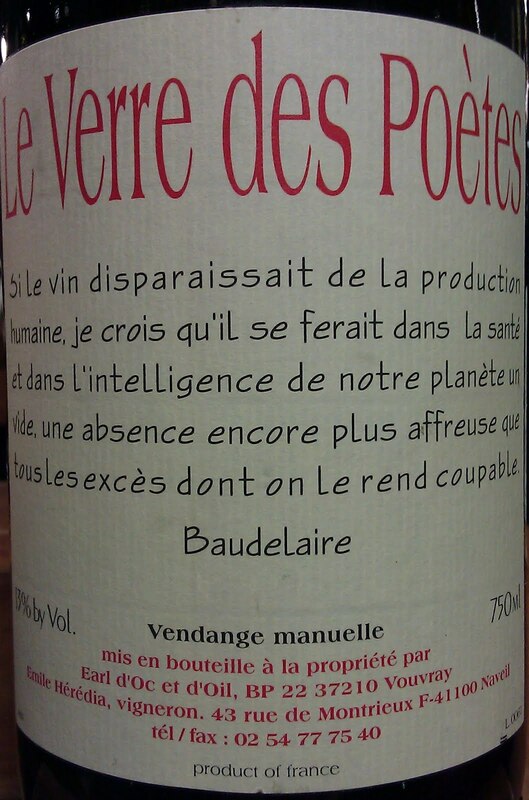 FYI: "Mieux vaut le vin d'ici, que l'eau de là!" 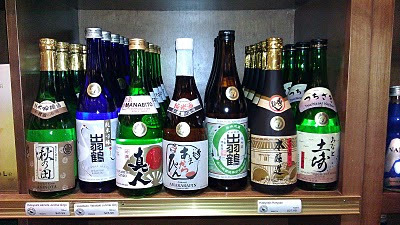 is also a great play of words meaning "Better the wine from here, than the water from up there! ", don't get it? no! Well, it is normal because "L'eau de là" is a French play of words, a metaphor also meaning "L'Au-delà" or "The Beyond" in English. Get it? Dominique Simon, ex-Sommelier of Bouley restaurant and owner of The Wine List (a New York Boutique wine importer/distributor), is a rather discreet guy, who always brings me well crafted, authentic wines from small, artisanal producers. And recently, he passed by with a producer from Anjou, Yves Matignon and his daughter Lucile, who were visiting New York for the time. Sister and brother, Hélène and Yves Matignon are the owners of Domaine Matignon, a small estate in Anjou, nestled in Martigné-Briand, a small village about 33 kilometers south of Angers, the capital of the Anjou region, and about 30 kilometers west of Saumur, on the southern bank of the Loire River. Domaine Matignon has been a family-run estate for the past 3 generations. 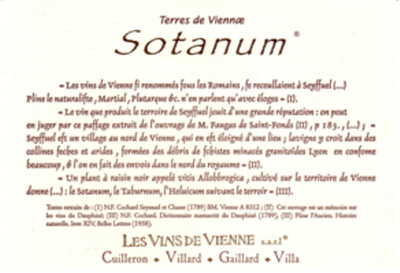 It covers 38 hectares of vineyards planted on diverse types of soil and Terroir. All work in the vineyard and the cellar is done under sustainable culture system, or "lutte raisonnée". Driven by the same passion, Hélène and Yves Matignon do everything themselves. 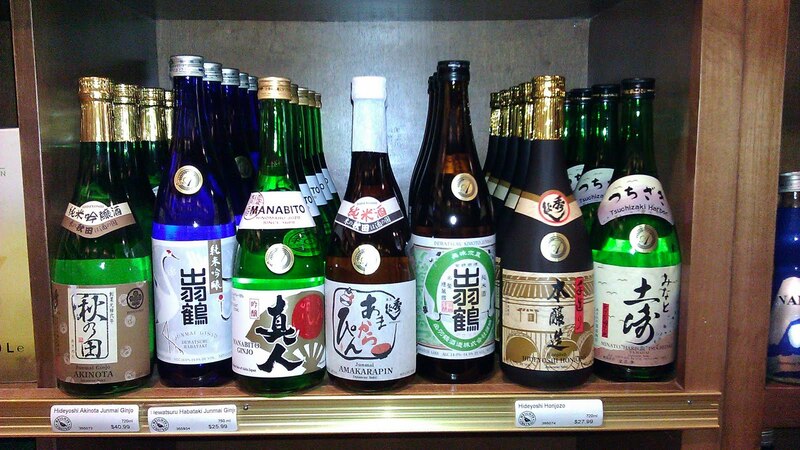 All their wines are grown, produced and nurtured naturally at the property by their own care. Made with 100% Cabernet Franc vinified in stainless steel tank, 2008 Domaine Matignon Anjou Rouge is very soft, elegant, with great acidity, lovely texture and balance. Following the fresh red fruit aromas of the nose, similar flavors gently expand toward the earthy, smoky finish. Nicely made. 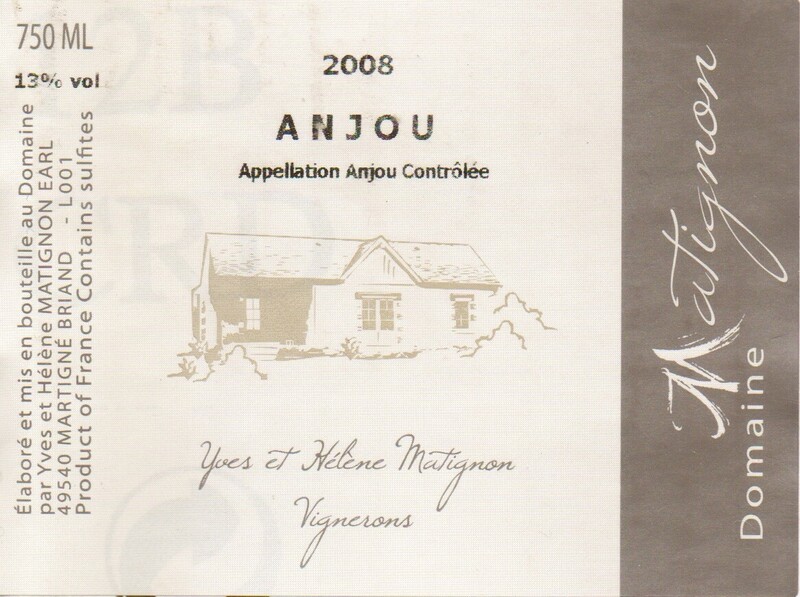 A solid and reliable, juicy Anjou rouge at $12, to drink young, within the next 2-3 years after bottling, and to pair with pretty much everything. 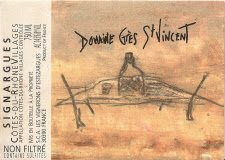 One may find trace of green and vegetal hints, which are classic, Terroir oriented characteristics of Loire Valley reds, especially when partly or fully crafted with Cabernet Franc or Grolleau. They are not defaults, but add crispiness and raciness to the overall profile of the wine; especially when combined with high, integrated and focus acidity, which nicely enhances the fruit and is definitely wanted. Also made from 100% Cabernet Franc, yet from older vines, Anjou Villages is generally a wine of choice with very good ageing potential (7-10 years after bottling). And this one is no exception to the rule. Robust, structured and harmonious, after fermentation, it was aged at least for 9 months in oak vats or barrels (en fût de chêne). 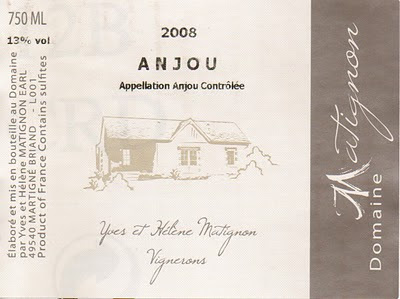 Despite a certain age, the 2004 Domaine de Matignon Anjou Villages Rouge has a youthful attitude and profile, offering lovely texture and structure maintaining the wine toward a fairly long finish. The nose and palate, despite the fruit flavors, also have green and vegetal notes and nuances, like asparagus and green pepper, but nothing off putting or surprising for red Loire Valley drinkers, and very typical to Cabernet Franc. I found it excellent and still quite young and vibrant despite its age. Another proof that, atop the quality and maturity of the fruit, acidity and tannins are key components to the longevity and ageing potential of a wine. Fuller and more complex than the regular Anjou Rouge, served at room temperature (14/15 ° Celsius), it will go wonderfully with red meats, game and cheeses. We also tasted the 2009 Anjou Rouge, but I found it too young and somewhat astringent for now, aside of the good ripeness of the fruit conferred by the quality of this particular vintage. 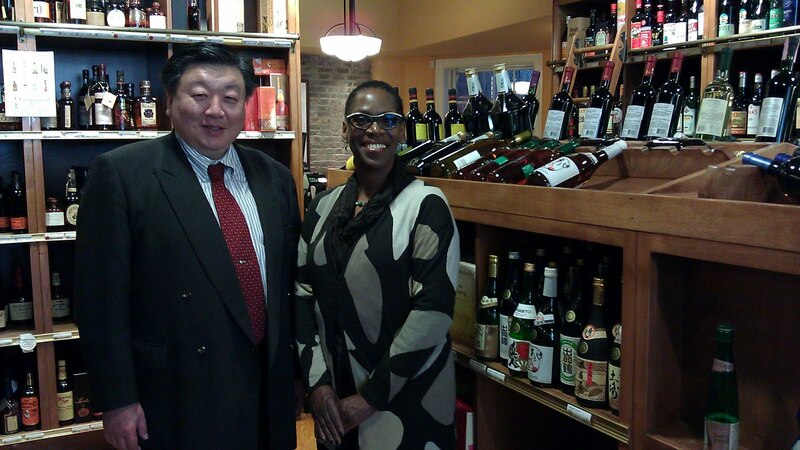 Thank you Yves and Lucile (and Hélène) for your visit and thank you for your wines. Keep up the good job!